We all need clothing: Children outgrow their clothes very quickly, and adults often find that their clothes do not fit anymore or wear out after many years of use. Did you know that buying secondhand clothes is an act of social justice? You have certainly heard about sweatshops in which employees work very long hours for minimal pay and often under hazardous conditions. Less well-known is the impact clothing manufacturing has on the environment: Growing cotton requires enormous amounts of water, and farmers often apply toxic herbicides and pesticides. Such chemicals often make farm workers sick and have an indirect long-term impact on human health through water, air, and soil pollution. The dyeing process and the production of the garments require additional chemicals (to make clothing wrinkle free, for example). Synthetic clothes (such as those made from polyester, acrylic, nylon, rayon, spandex, Kevlar) are even worse, as they use petroleum and contribute to environmental problems endemic to plastic. The manufacturing of clothing also contributes to global warming in many ways. What are some solutions, you are asking. Good-quality clothing can often be worn for decades. Each secondhand garment you buy means that one less needs to be produced. 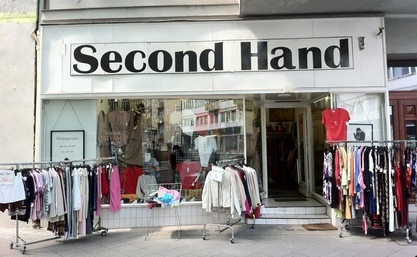 Moreover, secondhand stores are often charitable organizations. Hence, when you purchase your clothes in a thrift shop, you are contributing to the social good in many ways.